Teardrop Statement Necklace is rated 4.5 out of 5 by 25. Faceted faux gems are suspended like droplets of water from this gorgeous statement necklace. Rated 5 out of 5 by Esther56 from Nice Bought for my granddaughters birthday. Hope she likes it. Rated 5 out of 5 by VickiD from Just Right necklace I love this teardrop aqua & green necklace. I bought a new top at C & B that has some of these colors in the fabric & this necklace really sets it off! 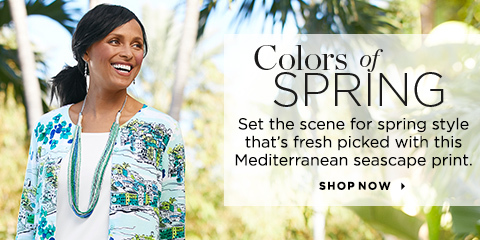 The colors are so fresh and the design and colors make a piece that I will enjoy wearing! Rated 2 out of 5 by Hollys from Not what I expected The "stones" are not colored glass. The color comes from a sticker that is applied to the glass on the front and back! When held to the light, very little penetrates through. Glad I waited until it was clearanced and didn't pay full price. Rated 5 out of 5 by JDS Mom from Very pretty and comfortable! I added this necklace to my online cart but couldn't decide if it was for me. I went in the store and had to have it. The colors are bright, fun and this necklace goes with so many outfits from C&B. I wish it came in other colors as well! Rated 5 out of 5 by Carol from Love the colors and style I bought this twice and have had to return both of them since they were broken. I am waiting for a third one. If I can get one not broken, I will wear as I love it and got the earrings to go with it. The colors are true to the picture. Rated 3 out of 5 by BLING123 from TEARDROP STATEMENT NECKLACE This is my first piece of jewelry from C&B take I'm a little disappointed with. The stone are beautiful but I don't care for the way they are strung across the wire. I like it enough to keep but just not 100% satisfied.